These tips are not just about how to reduce body fat but how to reduce blood pressure, reduce your risk of disease and increase your health. Besides the cosmetic issue of needing to reduce body fat, the health issue is an even larger issue. You are much more prone to diseases of all type if you are over your ideal weight. I will start with the biggest weight loss tip first: Start Today! If you are over your ideal weight then you are at a higher risk for all sorts of disease and ailments. The sooner you start, the sooner you start to reduce body fat and the sooner you reduce your risk. 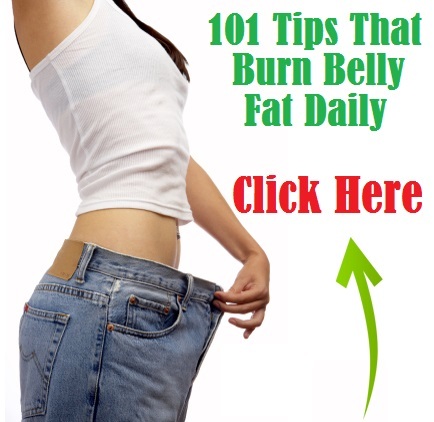 Click on this picture to get these great tips for burning belly fat. They also apply to anyone wanting to shed some unwanted pounds and just get healthier. Start Slowly. Don't try and do everything overnight. If you try and change everything at once you're going to fail. Take small steps like adding a salad to every evening meal or cutting out half of the oil used to cook with. Take small steps to healthy weight loss. Do not eat as much animal protein. This includes meat, poultry, eggs, cheese, and dairy products of any kind. The ideal goal is zero animal proteins, but just reducing the amount that you are consuming now will help you to lose weight and improve your health. The problem with animal protein is that it is low in nutrients especially the micro nutrients the body needs and also contains fat, cholesterol and quite a lot of calories to protein as compared to vegetables and fruits. Do eat as much of vegetables as you want especially leafy green vegetables. 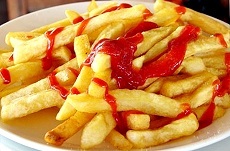 It is almost impossible to overeat on vegetables except starchy vegetables like potatoes and corn. Remember French fries are not vegetables. Satisfy your sweet tooth with fruit. Fruit is a tasty, sweet way to fill up on fiber, vitamins and anti-oxidants. Fruits are a great way to fight cancer and get vitamins such as vitamin C and plenty of fiber. Stay away from unhealthy carbs such as white flour, refined sugar, white rice and potatoes. You should be eating healthy carbs such as whole grains and beans, fruits and vegetables. Reduce or eliminate from your diet all saturated fats and trans fats. Saturated fats are found primarily in animal sources, which it would mean red meat and whole milk dairy products. Trans fats are basically the oils found in vegetable shortening, margins ,crackers, candies, cookies, potato chips and French fries as well as a lot of baked goods and process foods. Avoid sugar. Sugar causes energy ups and downs and can lead to health problems such as diabetes. You might not even be aware of the amount of sugar you are consuming each day. Sugar can be hidden in bread, soups, pasta sauces, instant mashed potatoes, frozen dinners and fast food. 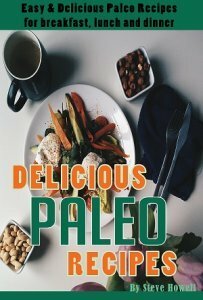 Eat naturally sweet food instead such as fruit, peppers, or nut butter. Get rid of the salt shaker. Not only is salt the high blood pressure culprit it has been made out to be, it also helps you retain weight. It helps your body store fat makes the fat denser and increases your cravings. The recommended sodium intake per day is 1500 to 2300 mg, the equivalent of about a teaspoon. Process foods like soups and frozen dinners usually contain a lot of hidden sodium that easily surpasses the recommendation. Be careful when eating out, most restaurants and fast food joints load their food with sodium. And the final tip to reduce body fat is something I know you've heard before, get some exercise. You don't have to go run a 5K marathon tomorrow but you could go for a walk around the block or go for a bicycle ride. Take the stairs at work instead of the elevator. Start small and work your way up to that 5K marathon. Of course always check with your doctor before starting any exercise program.